Wouldn’t it be nice if you could walk out into your backyard and find the medicine you need growing right there, ready to be picked and used to treat someone in your family who is ill or injured? So I made this small survival garden plan which holds the most practical and useful medicinal plants. If you think about it, 72 square feet is a very small piece of land (12 feet by 6 feet). My 72-square-foot Medicinal Garden is divided into two parts: one with annual plants (hardiness zones 6 and colder: basil parsley and spilanthes) and one with perennial plants, which really only matters if you live to the north where you have a cold climate that does not support year-round growing. The majority of the plants are listed as perennials. Basil has long been used as a culinary herb, flavoring many dishes for centuries, particularly Italian cuisine. Basil can also aid in digestion when made as an infusion and can clear mental fog if basil oil is put on the sleeves or collar of a shirt. Basil is also a powerful anti-inflammatory and can be used to treat inflammatory conditions, such as rheumatoid arthritis. It also has antibacterial properties and acts as an antioxidant. Basil can also be used in a bath. The leaves are the primary part of the basil plant that is used. Oils can also be collected for use on their own or in tinctures. Valerian can be used as a relaxant and sedative for the central nervous system, making it an ideal sleep aid. With the proper dosage, valerian can be taken to induce a restful sleep without the feeling of grogginess in the morning. In addition, valerian can be used to minimize stress and treat fear, anxiety, depression, nervous tension, and irritability. It also acts as a digestive aid and minimizes discomfort associated with asthma attacks. 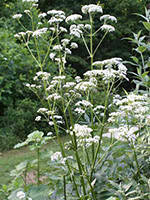 The root of the valerian plant is the part used for medicinal purposes. The root can be dried to be used as tea or made into capsules and the oils can be made into ointments or used as an essential oil or in tinctures. If you live in an area that is too cold for aloe, then you can easily keep it as an indoor plant, putting it outside in the summer. Aloe has long been used as a medicinal plant. The gel in the leaves can be used topically to treat sunburns, other types of burns, cold sores, frostbite, and psoriasis. Aloe gel can also be taken internally to treat various diseases of the bowel, osteoarthritis, itching and inflammation, fever, and to improve overall health. It can also be used to mitigate the effects of radiation treatments and to treat ulcers of the stomach, asthma, and diabetes. Aloe also has latex that is located just beneath the skin of the leaf. This can be taken orally to aid with constipation and a number of other conditions, such as menstrual cramps, epilepsy, depression, hemorrhoids, bursitis, and varicose veins. However, it is not safe to take aloe latex in large quantities. The leaves are the part of the aloe used. The gel in the leaves is primarily used, either topically or orally, but the latex can also be used in small doses. Calendula, also known as pot marigold, should not be mistaken for common mrigold or Mexican marigold. It is often grown as an annual, but is a perennial in areas that avoid cold winter conditions and subtropical summers. Calendula acts as an antiseptic and anti-inflammatory and can be made into topical salves, lotions, and balms that are great for treating burns, bruises, cuts, and dermatitis. Calendula drops can also be used to treat ear infections. Calendula has both culinary and medicinal uses. The petals have long been used in a similar fashion to saffron, being added to soups and stews. These petals were also once used to color butter and cheese. It is the dried petals of the flowers that are used for medicinal purposes. 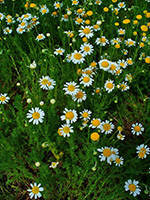 Chamomile is commonly used to treat an upset stomach or stomach cramps. It also has a calming effect that helps with sleep. It is widely used in Germany to treat wounds, abscesses, various skin conditions, and gum inflammation. The flowers are the primary medicinal part of the plants, although the leaves can be used as well. Flowers are generally used as an infusion or made into a tincture. It can also been used in a bath. Echinacea is known to be effective in shortening the duration and diminishing the symptoms of the common cold. It also is effective in boosting the immune system and fighting a number of other types of infections. Echinacea has anti-inflammatory, antifungal, antimicrobial, antibacterial, and antiviral properties and is effective for treating rheumatoid arthritis, chronic fatigue syndrome, migraines, indigestion, ADHD, pain, rattlesnake bites, and dizziness. The roots are the main part of the Echinacea plant that are used and have the most potency. The roots can be harvested and dried to make infusions or tinctures. The parts above the ground can be juiced and used topically as an anti-inflammatory and to promote the healing of wounds. Evening primrose is an effective painkiller and can be used to effectively treat headaches. It is also very popular as a treatment for any discomfort associated with menstruation, menopause, PMS, fibrocystic breasts, and endometriosis. It can also be effective in treating the joint inflammation and pain of rheumatoid arthritis, nerve damage that can come from diabetes, eczema, rosacea and acne, the damage caused by multiple sclerosis, memory issues that accompany Alzheimer’s disease, female infertility, and impotence. It is also useful for the nourishment of scalp, hair, and nails and can ease the symptoms of alcohol withdrawal. All parts of the evening primrose plant can be used in both culinary and medicinal preparations. The roots can be eaten in the same way as potatoes and the leaves can be eaten in salads or steeped as an infusion. Oil is obtained from the leaves and bark, which is the primary form for medicinal use. Parsley is extremely high in vitamin C, which is an essential vitamin for the body. It is also a natural breath freshener and has been known to help treat bladder infections, jaundice, and kidney stones. Parsley oil can be used to treat head lice and as an ointment for swollen areas, including swollen eyes. Parsley tea or water rubbed on the skin is good for insect bites and stings. Oils can be obtained from the leaves and roots and leaves can be made into an infusion. Parsley also has many culinary uses. This annual is also known as the toothache plant. Chewing on its flowers can promote the flow of saliva. The plant has the ability to cause mild numbing, which is ideal for a toothache. It also has antimicrobial properties, which makes it a good choice for oral care. All above-ground parts of spilanthes can be used. They can be eaten fresh or made into a tincture. It is effective when combined with Echinacea for treating colds and flu. The most common use for feverfew is the treatment of headaches. Feverfew has been shown to reduce the severity, duration, and frequency of migraine headaches. Feverfew can also be used to treat fevers and has anti-inflammatory properties that have made it useful in treating conditions such as rheumatoid arthritis. While the leaves are the most commonly used part of the feverfew plant, all parts of the feverfew plant that grow above the ground can be used. Flowers and leaves can be cut fresh and made into an infusion or can be dried for later use. It can also be made into a tincture that can be taken internally or used topically. 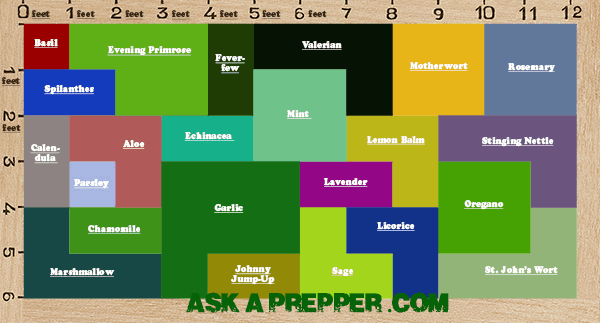 Yes, garlic CAN be grown as a perennial! It’s not what we are used to or what is recommended, but if you plant a number of plants and only harvest the bigger ones each a year, the others will come back the following year. Garlic is a powerful medicinal plant. It is a very powerful antibacterial, antiviral, antimicrobial plant. It is used to help treat and prevent heart disease by preventing hardening of the arteries and it combats high blood pressure and high cholesterol. Garlic boosts the immune system and helps ward off cancer because it is such a rich source of antioxidants and it is an effective anti-parasitic. It can also be used topically for the treatment of wounds and made into garlic oil (with olive oil) to treat earaches. The garlic cloves are harvested and used for both culinary and medicinal purposes. Garlic can be used fresh or it can be crushed and dried. Garlic extracts are also an easy way to enjoy the amazing benefits of garlic. The reason why I plan to plant it on 7 square feet is because I like it in food a lot. Some call it a violet, some call it a pansy. 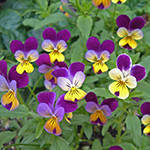 The Johnny Jump-Up is part of the viola family and it is easy to grow, pretty, and can be put to culinary and medicinal use. Be sure to plant the wild seed variety. They can be easily sown from seed, but once a root has been established it will come back each spring. Also known as heartsease, Johnny Jump-Up is mild enough to be used on children. It is most often used as a blood cleanser and to increase metabolism. It is good to combat gout and rheumatoid arthritis and can minimize tiredness that comes in the spring. It also works as a diuretic, making it good for issues with urinary tract, and it is an effective antiseptic. Topically, Johnny Jump-Ups can be used to help treat eczema, herpes, psoriasis, and other skin problems. The entire Johnny Jump-Up plant can be put to both culinary and medicinal use. It can be made into an infusion, either hot or cold, and it can be dried into a powder to be made into a poultice for external use. The smell of lavender sets it apart and has been used as a calming agent for centuries. Its scent has been known to calm nerves, aid in relaxation, and have a general soothing effect. It can even be used to treat ongoing anxiety and nervousness, as well as headaches, sleep disorders, and cardiac palpitations. Lavender can also be used as a digestive aid and will help alleviate digestive issues, such as indigestion, nausea, and flatulence. Lavender oil is an antiseptic that works well against bacteria, such as those that cause typhoid and diphtheria. It can also help treat the common cold, coughs, asthma, and more and has been successfully used to treat alopecia areata (hair loss due to an autoimmune disorder). Lavender needs good drainage and lots of air circulation. The parts of the plant that are used include the flowers and oils extracted from the flowers. Lemon balm has long been referred to as an “herbal valium.” It is commonly used to treat sleep problems and as a sedative and antianxiety treatment. Lemon balm is high in antioxidants and acts as an antiviral, an antispasmodic, and an astringent. Lemon balm brings out a sweat that helps fight colds and break a fever. It has been proven helpful against chronic fatigue syndrome, ADHD, eczema, headaches, high blood pressure, and Grave’s disease and it inhibits the division of tumor cells. It is also useful in keeping mosquitos at bay. Do you know when you should take an antiviral and when to take an antibiotic? If not, read this article: The Only 4 Antibiotics You’ll Need when SHTF. Lemon balm leaves are used as an infusion or in the bath. The oils can be used as essential oils or made into a tincture. Traditional medicinal uses for licorice include for sore throats, cough, bronchitis, bacterial and viral infections, and inflammation. It is also highly beneficial in treating stomach ulcers. Licorice has also been shown beneficial in treating heartburn, constipation, and hepatitis. The root of the licorice is used and is ready for harvest by the third or fourth year of growth. The roots can be used fresh or dried. The top roots or top parts of larger roots can be harvested, leaving the lower roots to regrow. The most common use for marshmallow is to treat sore throats and dry coughs because the plant contains antibacterial properties and acts to suppress coughing. Marshmallow has also been used to treat indigestion, heartburn, and other digestive issues. When consumed on a regular basis, marshmallow can reduce the pain associated with ulcerative colitis. The extract of marshmallow can also be used topically to treat various skin conditions, such as contact dermatitis and eczema. There is evidence to suggest marshmallow can help in the treatment of asthma and may be useful in the management of diabetes (video ad). The leaves and root of the marshmallow plant are used. Tea can be made from fresh or dried parts of the plant. Dried marshmallow can be made into capsules and the extract can be used to make tinctures. The mints are a great aid for digestion and in relieving digestive upset, including gastrointestinal pain and flatulence. It is also useful for treating colds, headaches, and cramps. The leaves of the mint plant are used in infusions and oil is extracted for use in tinctures or on its own and as a flavoring. 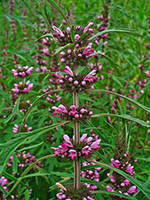 This herb was named motherwort because it was traditionally thought to be a help to mothers. It was given to pregnant women in ancient Greece to calm anxiety. It is mainly beneficial to the heart, acting as an antispasmodic and used for an irregular or fast heartbeat, particularly when caused by anxiety and stress. It can also be used to lower blood pressure. Motherwort has also been used when menstruation has been irregular or absent, for flatulence, and for an over-active thyroid. All parts of motherwort that are above the ground can be used for medicinal purposes. Infusions and tinctures can be made or the herb can be dried and stored or put into capsules. It is full of vitamin K (coagulant) and antioxidants, as well as a number of other important vitamins and minerals. It is useful in the treatment of acne and dandruff and a number of other skin conditions. Oregano also acts as an antibacterial and anti-inflammatory agent, which is useful when treating colds, bronchitis, toothaches, earaches, and intestinal parasites. It can also be used to treat headaches, bloating, fatigue, and menstrual cramps and will help repel insects. Oregano leaves are used for both culinary and medicinal purposes. They can be harvested and used fresh as a seasoning in food or as an infusion and they can be dried and stored. Oregano oil can be extracted and tinctures can be made. Related: Best Natural First Aid: Stops Bleeding In a Few Seconds! Rosemary is used topically, as well as taken internally. When used topically, it can be used to increase circulation, for the prevention and treatment of baldness, to treat eczema, and to treat muscle and joint pain and sciatica. It helps heal wounds and acts as a good insect repellent. Taken internally, rosemary helps treat digestive issues, heartburn, problems with the gall bladder and liver, and increases appetite. It can help minimize memory loss due to aging and to treat headaches, high blood pressure, gout, and coughs. The best rosemary oil is extracted from the flowers, although oil can be retrieved from the stems and leaves. All above-ground parts of rosemary can be used as an infusion and rosemary has a rich history of culinary uses. Sage has many medicinal uses. It can be used to treat digestive issues, such as flatulence, bloating, stomach pain, and heartburn. It is also used to reduce the overproduction of saliva and sweat and can be helpful in treating memory loss, depression, and Alzheimer’s disease. It can also be used by women to reduce an excessive flow of milk, ease painful menstrual cramps, and minimize menopausal hot flashes. When applied topically, sage can be used to treat gum disease, cold sores, a sore mouth and tongue, and sore nasal passages. The leaves are the part of sage that is used for both culinary and medicinal purposes. The leaves can be rubbed directly on the skin, made into an infusion, dried and stored, or the oils collected as an essential oil or to be made into a tincture. Stinging nettle grows wild in many places and it can also be grown in a garden. It has wonderful medicinal properties. Stinging nettle is frequently used as a treatment for arthritis and allergies and to promote the health of the kidneys. The natural antihistamines found in stinging nettle is ideal in the treatment of allergies, and when combined with the plant’s anti-inflammatory properties, will ease bronchial and sinus congestion due to allergies. The root of the plant acts as a diuretic that actually minimizes the need to urinate at night. Soak stinging nettle leaves overnight to make an infusion to pray on other garden plants as a fertilizer. The leaves will lose their stinging properties when they are cooked and dried. They can then be made into an infusion, steamed, or used in soups and stir fries. The roots can also be used and can be dried and powdered. St. John’s wort has been used as a medicinal plant for over 2,000 years. Aside from many superstitious uses, St. John’s wort has been used as a treatment for colds, congestion, bruises, wounds, inflammation of the bowel, headaches, and menstrual cramps. However, the most common use for St. John’s wort is as a mild antidepressant. It can be used to treat low to moderate levels of anxiety and depression. The flowers are the part of St. John’s wort that is used and should be harvested when about 50% of the buds have opened, which means timing is very important. It is important to protect the skin and eyes from direct contact with the plant during harvest. 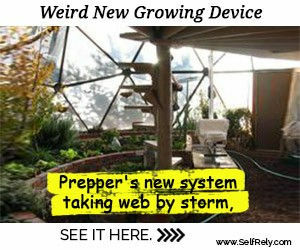 Maybe some of you have read my article This Common Driveway Weed is One of Nature’s Most Powerful Survival Plants and wonder why this plant is not in my SHTF medicinal garden plan. Simple: this plant grows everywhere… I don’t need to plant it to use it. Hi! I’m an herbalist, and make many preparations at home. You should buy a couple easy-to-follow textbooks: 1. Growing 101 Herbs That Heal by Tammi Hartung, 2. Home Remedies by Michael Van Straten 3. The Herbal Medicine Cabinet; preparing natural remedies at home by Debra St. Claire. The last is a “cookbook” that explains, step-by-step, how to prepare herbs for medicinal usage. Lastly, I strongly recommend you read ANYTHING by Susun Weed. She is the bee’s knees, the cat’s P.J.’s, the very last word on all things diy herbal. Susun does live classes too. Best of health to you! Great minds think alike ! I had the same idea abt 2 yrs ago after taking a medicinal herbs class. Why buy when I can grow & dry my own. I have also done tinctures. My comment is that I found the mints and oregano to be very invasive. I have the mints in large pots and the oregano is by itself. excellent inspiration. I’m setting up something similar. But I’d remove the hard to grow annuals and replace with perennials. Say comfrey, dandelion, coltsfoot, daisy, primrose, borage and chicory to name a few. many of these plants can be eaten raw, not to cure, but to prevent… a nibble of everything in that garden equals a full meal of superhealthy medicinal food which will grow back faster than can be consumed 🙂 awesome presentation! Your idea has merit in it’s intentions but some of those herbs will give you big problems soon. Like the mints which will spread rampant roots quickly and takeover. Pots are best for them. Lemon balm and feverfew take over by seeding everywhere, and St John’s Wort likes to do the same. As for stinging nettles, you sure don’t want to be bumping into that while it’s growing. I highly recommend it be planted in a quiet corner by itself. When sage gets larger, it flops over top of everything, and parsley is a biennial and will go to seed next year and the parent plant will die off. Marshmallow makes large roots that are hard to pull out and dislike being replanted. Even if you plan to control things with regular clipping, plan to put in a lot of time to catch things before they seed everywhere. I wish you luck. …and if you DO bump into stinging nettle, make a lovely nettle tea, (I used dried leaves of stinging nettle that I dried) to wash the stinging area- nettle tea actually negates the sting! How do I know? Been there in the nettle patch, done that… fixed it with nettle tea. Buy a used copy of John Lust’s “The Herb Book”.. Excellent herbal! Americans suffer needlessly in pain everyday. barely deal wifh people in chroinic discomfort which is likewise a shame. caring physician that cares bout treating chronic pain effectively, properly and successfully on a drug treatment program. You are right. The book, Essential Survival Guide to Medical Preparedness has come under fire by the FDA and the author just announced it is going out of print, and will not be republished. They went after her and her family over the info she published on her website (which has since been pulled down), and now is threatening her over her book. Scary times. Tumeric and Ginger are two I would definitely not to be without. Be sure you contain oregano and mints in a big pot or container. They spread like crazy. My spearmint has taken over my raspberries and my rock wall. I pull and pull and it keeps growing back. Oregano spreads by runners. I have it growing in places it was never planted. Bee balm and borage are big self sowers as well. Tarragon can get out of control as well, but not as fast as oregano. I am going to try this next season. Thanks for the helpful info. Botanical names for these plants would be good. Some common names are clear but some like licorice are unclear what the plant is.